"Hi! Thank you for stopping by my ESBQ gallery. Much of my artwork can be described as boldly colorful, whimsical and (sometimes) a little zany. My art ranges from realistic wildlife and fantasy animals to off-beat, innovative creatures that are my own original creations and has been collected worldwide. Please, feel free to explore my art gallery, visit my blog spot, myzazzlestore (where my artwork comes to life on ties, mugs, necklaces, postage stamps, cards, t-shirts and more!) and the other websites where I regularly list my art for sale. I also have a Facebook listed page under Kim Loberg Studio you can visit. I have always been fascinated with animals in both their natural state and as fantasy creatures. Having a very fertile imagination, fantasy takes hold and one of my horses becomes a great sea steed, wild and free to roam the depths of a fantasy ocean. My housecat Bob becomes a bat-winged creature or a witch's spider-cat while our roosters morph into zombies, walking the earth on Halloween night, which by the way, is my favorite holiday. Nature and color are the elements that motivate my paintings. Color breathes life into my art, giving it depth and form. Viewing nature sparks my imagination, embarking it on an endless journey with beautiful and sometimes unsettling results. That journey is also part of my quest to define my work and find my niche in the art world. Kim Loberg is a professional Nebraska artist that has been drawing since pre-school years and oil painting since age 14. She produces her artwork from her studio Kim Loberg Studio, in a variety of mediums including pencil, ink, pastels, acrylics, oil paints, and watercolors. Kim also sculpts with a needle and thread in fabric and also in clay. 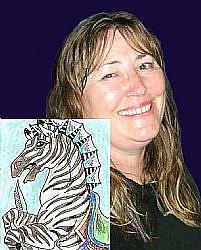 Carousel horses, hippocampus, dragons, animals, fantasy, and wildlife are her favored subjects. Her artwork has been exhibited at the Miniature Art Show at Prairie Winds Art Center in Grand Island, Nebraska, the NNAA Annual Spring Art Show, the 2011 and 2012 Juried Art Competion at the Norfolk Arts Center, the Nebraska Game & Parks Commission State Habitat Art Contest, the 24th Annual Wyoming conservation Stamp Art Competition, Sale & Show, and at Wayne State College's Juried Student Fall 2007,Spring 2008, Fall 2008, Spring 2009 art shows. Kim's Senior Art Exhibit was held April 14-23, 2009 at the Nordstrand Art Gallery at Wayne State College, Wayne, Nebraska. Kim has an Associate of Arts Degree in Art and an Associate of Applied Science Degree in Business Management-Entrepreneurship from Northeast Community College and a Bachelor of Science Degree in Studio Art from Wayne State College. She is a member of the Northeast Nebraska Art Association. She is also a member of the web-based groups Halloween Artists, HA31, WHOA Horse Artists, ACEO-Art Cards Editions and Originals, ATC & ACEO Enthusiasts, SFA-Small Format Art, and the Nibblefest Art Contest. She is also a recognized national designer and operates Kimberly Ann's, a home-based business. Using acrylic fur fabric as a medium, she creates stick giraffes, dragons, unicorns, cows, and pigs, as well as traditional stick horses for children of all ages. Her whimsical animal kitchen towel sets add an amusing touch to any kitchen.